Yet another video sent to me of a Screaming Baby with amazing floating skill, where they recover into a float position no matter what. Please Stop It! Can I just say that I don't find these videos amazing at all? I can't work out why these swim teachers are not taken to court and prosecuted. It doesn't matter what the swim teacher, teachers a child it can be taught without the child screaming. Given that we know this for a fact; and not only have I shown this to be the case but teachers all over the world have shown it to be true, there is no justification for forcing a child to learn anything. Yet there are still swim schools out there, that persist and somehow are allowed to continue this disturbing behavior (I can think of more descriptive language but I don't want to be subject to possible legal action) all under the guise of "it's OK because it works". The latest video I was sent even resorted to subterfuge by putting gentle calming music on the video instead of the natural sound, to try and cover up the fact the child that the baby in the video is actually screaming. How do I know the child was screaming if I could not hear it? Because if you simply look, you can see the child with its mouth wide open, shaking they are screaming so much. 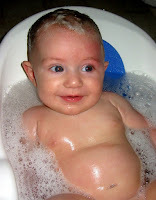 I have covered this topic in passing in my articles Babies First Swimming Lesson: Prepare Your Baby and Babies, Breath Control & Reflex Action. But there is no need to take my word for it. Why not read what one of the top swim teachers has to say on the subject. More than that I can't believe that swim schools that promote these videos are convinced that it makes children safer. Sure they are more weary around that water but it is not because they have a respect for the water or have a sense of water safety, it's because they are terrified by it or at the very least they hate it. Why wouldn't they as they were virtually tortured by it when they were taught to float.